Fee & Fonske or Mieleke & Dolf? Between 1949 and 1951 Ons Volkske featured the adventures of Fee & Fonske under the name “De Fratsen van Fee en Fonske” (which would also appear as “De avonturen van Mieleke en Dolf” both in Kuifje Weekblad… and Ons Volkse), see also our article “Mieleke & Dolf / Bouboule & Noiraud make their entry in 1949”. As you can see, the name of the series is not the same as both main characters saw their name changed from Fee & Fonske to Mieleke & Dolf for Kuifje Weekblad., (and apparently Ons Volkske followed in a later stage). Not that Bob De Moor paid much attention to the difference as you can see in today’s example where he mixes the names. Here Bob De Moor uses different names for the main characters than the title of the series. Good to know, the series consists of 100+ strips but was never published in its chronological order, instead you see the numbering going up and down (when he uses the ‘Bi’ signature or no signature at all) and disappearing (when he ads ‘Bob De Moor’ as signature or no signature at all). Also the haircut of the characters changes all the time which makes us believe that De Moor already had this series prepared a bit before they were published. In the example we offer today you can see that despite the fact that the series is called “De Fratsen van Fee en Fonske”, the names used in the strip are Mieleke en Dolf. It doesn’t really make it easy to correctly complete the chronology of this 66-year old series. Overtime you can see that the drawing style gets more and more refined hinting at his involvement in the Hergé studios. This series has unfortunately never been published in book format, except for an extremely limited run (we talk about 50 copies at maximum) via Jean-Pierre Verheylewegen in 2001 (or 2002), but this publication didn’t include all of the strips ever published. At the moment I am collecting all the missing strips and have already been able tracing a lot, including the one you saw today. In 1949 Ons Volkske started to publish the adventures of Mieleke & Dolf / Fee & Fonske which was also published in the Flemish weekly Kuifje. In French the series was known as Bouboule & Noiraud from the publications in Junior – from 1954 on – and in the Journal Tintin – from 1949 on. This series has unfortunately never been published in book format, except for an extremely limited run (we talk about 50 copies at maximum) via Jean-Pierre Verheylewegen in 2001 (or 2002), and even this publication didn’t include those strips published in the Journal Tintin. The family De Moor was so kind to provide us with material from this publication, more specifically we’ll show you the 3rd strip of this series as published on January 27, 1949 in Ons Volkske. 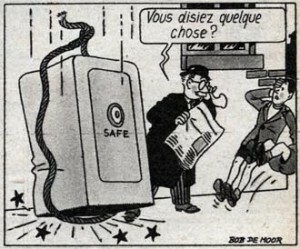 The 3rd strip of this series as published on January 27, 1949 in Ons Volkske. The one strip gag “De avonturen van Melee en Dolf” is part of the many series Bob De Moor saw published at the end of the 40s in magazines and youth extra’s for newspapers. Other series that consisted of one strip cartoons included the adventures of Vodje, Kareltje or yet De Rosse. They all have in common that they also never have been published in book format (except for the above mentioned limited run). Note that not all the cartoons were published as a strip. De Rosse for instance was often published as a square with 4 frames. The same happened once to Mieleke & Dolf when the Journal Tintin published the cartoon as a vertically positioned 3-frame strip to better fit the page layout. 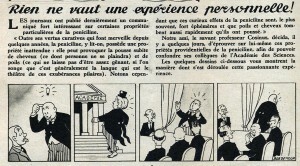 A detail of Bouboule & Noiraud as published in the Journal Tintin in a more Hergé like style. The whole is a typical example of the typical flemish one strip cartoons which were independent from each other and as such never needed a cliff hanger, just a joke. Situation humor is key in such case. The jokes remind a lot of the early one page gags of Hergé‘s Quick & Flupke. On the flemish side of the comic world you could compare the type of humor with the one you could find in the early cartoons of Jommeke which Jef Nys would create in 1955 for the catholic weekly Kerk en Leven (also known in Flanders as ‘het parochieblad’). Truth to be told, Nys used a full page to develop his gags whereas Bob De Moor only used 3 to 4 frames at maximum. Sometimes De Moor would use plenty of dialogues but mostly the dialogues were quite limited. Over the years the style in which the comic was drawn changed quite a bit, from the loosely drawn first strips as you can see here to a graphically more styled duo as published in the Journal Tintin. 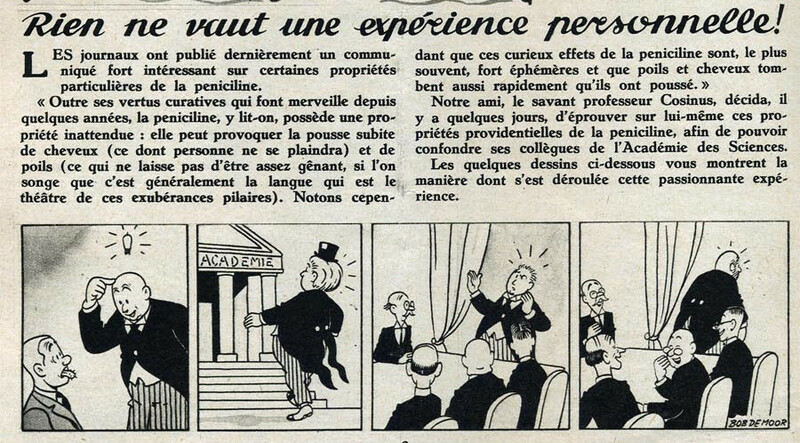 In the cartoons published for the Journal Tintin you clearly start to notice the influence of Hergé‘s style of drawing, less ‘bubly’, more refined. You could also say that he seemed to have had more time to finish the drawings although one must admit that the strips created for Mieleke & Dolf are amongst the finest cartoon style work De Moor would develop in the late 1940s. 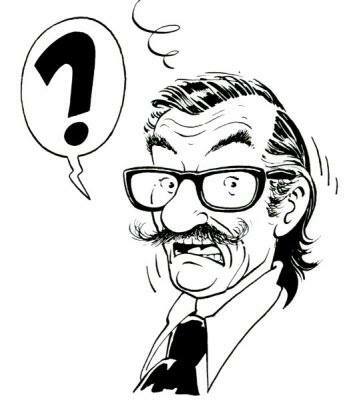 On September 29, 1949 Bob De Moor saw his very first work published in the Tintin weekly. He had been hired by Karel Van Milleghem to aid Eugène Van Nyverseel (aka Evany) with the layout work of Tintin, more precisely to make small drawings, do the lettering etc. Professor Cosinus, the first drawings for Tintin/Kuifje. The first story for which Bob De Moor delivered some accompanying drawings can be seen on the left. It’s about a certain Professor Cosinus. Bald, he is confronted with someone suffering from a black hairy tongue, a side-effect of using Penicillin. The affliction is caused by bacteria or fungi in the mouth, which make the tongue appear black and hairy. They can grow to 15 times their normal length actually. Tasty no? Anyhow, Penicillin can also provoke a sudden hair growth (not just on the tongue) and as a result Professor Cosinus decided to rub his bald head with Penicillin. Little did he know that Penicillin is not only known to cause temporal hair growth, it can also provoke hair loss with people with high blood pressure, rheumatoid arthritis, high blood cholesterol, multiple sclerosis, depression and so on. We’re not sure what the problem was with Professor Cosinus, but he starts losing his hair the moment he arrives at the table. He leaves ashamed and ridiculed by his fellow academy members. You would have thought that Professor Cosinus was a bit smarter than that, since he is a member of the Science Academy. The style used here is quite similar to the one he would use for Mieleke & Dolf aka Fee & Fonske aka Bouboule et Noiraud in French which would start to appear later that year.